The 1st World War sweeped away the echoes of the Belle Epoque and its soundtrack, which Italy had known as the happy season of the Romanza da Salotto (Salon Music) written by Francesco Paolo Tosti, Luigi Arditi, Augusto Rotoli, Luigi Denza, Renato Brogi, Ciro Pinsuti, Enrico Toselli and others. The genre was vastely performed throughout Europe and the rest of the world, where it still enjoys great popularity to these days. Almost as a revenge, a group of musicians, who at the time of the Battle of Caporetto were no more than young girls, imposed themselves from the 1920s onwards as authors of new salon music that cleverly reinvented traditional heritage of the Italian folk song. They are the Milanese Giulia Recli (1884-1970); Eugenia Scarpa born in Constantinople and known in the history of music as Geni Sadero (1886-1961); Barbara Elena Giuranna of Palermo (1899-1998); Elisabetta Oddone Sulli Rao, another Milanese (1878-1972) and Giovanna Douglas Scotti, a very eclectic artist, who also became an unknown musician as it is easier to find some information about her as a painter than as a composer. This CD comes to dissipate the fog on these women’s memory and to show delicious examples of how they were so talanted capable of capturing the romance of the Italian Salon Music: this musical genre, which has conquered the audiences of all time, and that was the musical result of composers without shame. Without shame of the melody! With the consious and passionate piano of Angiolina Sensale, and the musical sensibility of Susie Georgiadis, this musical treasure presents Giulia Recli, daughter of pianist Luisa Biancardi and singing pupil of the legendary tenor of Cesena Alessandro Bonci, as well as composer pupil of Ildebrando Pizzetti. Her piano solo piece, Il sogno di Nicoletta was taken from the suite Alcassino e Nicoletta that was presented in 1931 at the Metropolitan in New York and was later published in Bologna by Bongiovanni in 1938. Also by Recli, who was also an exquisite teacher, La Culla (Ricordi 1922), which recalls a Sicilian lullaby sung in Trapani; Cardellina (Ricordi 1922) a traditional song of Corsica; Sul fiume, work published in 1915 when she was experimenting her own composition tecniches, in 1917, and Il pastore canta, a work of love, full of hope, on the text by his sister Maria. By Geni Sadero, the daughter of a Mariner commander from Trieste, who was also a good soprano with acclaimed theatrical life, we have the Gondoliera Veneziana, an echo of a magic for lovers on the waters of the lagoon, which was part of the repertoire of famous singers like the brilliant mezzo-soprano Gianna Pederzini and the talented baritone Tito Gobbi. 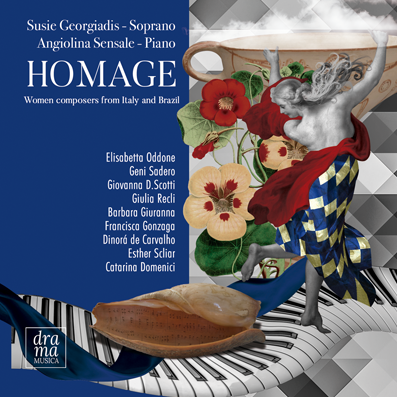 Passionale and Serenata allow us to cast a spotlight on Giovanna Douglas Scotti, a composer who was completey erased from the history of music. There only a few precious publications that have allowed us to bring her back to history with this CD that, for the listeners and for the composer herself, is a priceless unique moment. In fact, Giovanna Douglas Scotti Della Scala was born in an aristocratic family from Romagna in the Forlì of 1889, the year in which the Eiffel Tower was inaugurated and that the Napolitan pizzaziolo Raffaele Esposito dedicated the Margherita tricolor pizza Margherita (white mozzarella, tomato red, green basil) to Queen Margherita di Savoia. Remaining orphan she moved to Milan to live with her paternal aunt Corona Douglas Scotti, wife of the painter Leonardo Bazzano (not to be confused with the 16th century Sicilian homonym) who lived between 1853 and 1937, who started teaching her to paint some portray and small landscapes on oil paintings. While learning ceramics’ technique, Giovanna Douglas Scotti also have piano and singing lessons. She aslo falls in love with the work of Dante Alighieri and his Divine Comedy, which she studies thoroughly. She was engaged with the Pavese painter Alessandro Gallotti (1879-1961), but never married, preferring the freedom of the artistic life. In Brera she exhibited his works in 1918 and 1920 and she is quoted as the author of the Primavera dell'Alpino inspired on the ladscapes of Stresa, very popular with the artistic world on the slope of Mottarone, where she had been for many years with her boyfriend. Serenata (1938) is dedicated to the excellent Milanese tenor Francesco Merli (1887-1976) who was a great interpreter of Otello; while Passionale is a song that confesses love and hatred for the beloved woman to whom she feels a shocking jealousy. Wife and mother of distinguished musicians Barbara Giuranna is the one who best managed to break the barriers of the prevailing chauvinism of the mid-twentieth century and to affirm her talents here witnessed on the song Stornello (1936). The Tuscan love song dedicated to passion above all things: any sacrifice is worth to be able to love the man who took you heart and mind. Capelli d'oro is the melody that, with words from the 17th century, recalls the tribute to the feminine beauties of Petrarch. Elisabetta Oddone mezzo-soprano, writer and composer. Set these words to music as well as lots of other works for children, she who with Balilla Pratella directed the FA-MI theater in Milan for children's shows. Songwriters Gonzaga, Carvalho, Scliar and Domenici form an impressive array of artists sharing qualities of dare and resolve both in life and in music. These songs, each in its own uniqueness, express both depth of feeling and musical grasp. Chiquinha Gonzaga (1847-1935), left a mismatched marriage and, defying all social conventions prevalent at a her very conservative nineteenth century Rio de Janeiro, gradually invested in a musical career as a performer, conductor and composer of light music and comedies. While Lua Branca [White Moon] displays a sentimental ambience, Taci [Shut up, in Italian] begs the lover not to utter the word leading to the end of the affair. Contrastingly, Roda Ioiô [Swirl around Ioiô- Ioiô is a man´s nickname] cautions the lover to return and does so with plenty of good humor and sensuality. The piano solo initially titled O Gaucho was written for a comedy play in 1895. The play was not very successful and after a few runs it folded. The song, however, was used at another comedy with new lyrics and a favorable reception that merited a recording in 1902. It became quite a hit under the new denomination- O corta-jaca. The slang expression refers to a matchmaker and bootlicking individual, a minion in the crudest sense. The rhythm of the Brazilian Tango, one the many denominations of the nascent Samba, posed an irresistible attraction, it figured high in the list of preferred Carnaval songs for many years to come. In 1914, the young, beautiful and spirited Brazilian First Lady, D. Nair de Teffé played O corta-jaca not at the piano, but on the guitar. This event took place during a soirée offered to the Diplomatic Corps causing an unprecedented scandal. Members of the opposition lashed out passionate speeches decrying the moral decadence of the government. Rui Barbosa, the leader of the opposition pronouncing from the Senate, argued the fact that instead of Wagner, the government was supporting the lowest forms of Brazilian vulgarity. Fortunately, his moralizing rhetoric fell into deaf ears; the saucy song remained a favorite. Dinorah de Carvalho (1905-1980), an imposing personality, distinguished herself as pianist, pedagogue and composer. Contrary to the trajectory of most female composer, she received ample familial support to pursue her career both in her native country and abroad. Although the song text depicts the lament of a victim about to be slaughtered, the song is named after the perpetrator, Pau-Piá. While the nameless female voice pleads for her life with an expressive melodic line, the piano displays persistent dotted figurations of varying lengths. At last, the female voice, knowing her inescapable fate, resigns to her tormentor´s pattern. Esther Scliar (1926-1978), the devoted and highly competent pedagogue, while fascinated by mid twentieth century musical vanguard, wrote gentle love songs seeking to abide by the artistic guidelines of soviet social realism she also fiercely believed. While teaching the laws of strict serialism and atonality, her own songs- Modinhas 1 and 2 and Novos Cantares display key signatures, clear cut formal structures and impeccable word setting. Contrastingly, the chromatic content of the piano parts resulting in angular lines and raw dissonances hardly conceal the inner turmoil of her life. Catarina Domenici, a gifted pianist, pedagogue and composer says that the song Healing, written between 1999 and 2018, is a Lullaby for her younger self. It captures the dissociative condition children who are sexually abused experience as a coping mechanism. As if frozen in time, in a haze of suspended animation, the young self lives in a state of trauma and necessitates to be mothered by the older self in order to heal. Domenici establishes a dialogue with two songs - Dido’s lament as an expression of both desire and willingness to die, conflicting feelings often experienced by trauma survivors and, Schubert’s song Gretchen am Spinnrade first verse to convey the hopelessness of a heavy heart. Marielle presente (2018) was composed in memory of Rio de Janeiro councilwoman Marielle Franco cowardly assassinated on the night of March 14th, 2018. Emblematic of the fate experienced by prominent women in politics and social movements, the verses also honour recent victims of feminicide as a result of domestic violence, harassment in the work place and the gruelling routine of death threats left-wing women politicians endure. The accomplishment of a personal musical project that would also include a CD recording was something that always I kept in my "dream box". When Gabriella Di Laccio, founder of the label Drama Musica, invited me to take part of the project "DONNE", which amongst many diferent iniciatives aims to promote the works by women composers through the recording of their compositions, as well as being happy and honored, I was also curious and soon afterwards surprised by how many composers I found! Since I have lived in Italy for many years, I thought it would be more true to my personal history if I dedicated myself to a CD that would show some of the composers from Italy and also from Brazil, my native country. Together with Angiolina Sensale we began an interesting and beautiful reserach through the world of Italian composers, who were all to me, all unknown! After every rehearsal, every new reading, every new discovery, I became more and more fascinated with the incredible musical world of these women and the richness of their compositions! Amongst the Brazilian, it seemed to me essential to mention Chiquinha Gonzaga, whose participation in the Brazilian artistic scene was fundamental for the definition of the musical identity of the country in the early twentieth century. Besides being the creator of a vast and rich repertoire, she was also a woman ahead of her time, who fought for important causes in Brazil, such as the abolition of slavery. The choice was very arduous, given the vastness of Chiquinha's repertoire. Among the choices I would like to quote "Taci", her only "romanza" with original Italian text. For this song, we cerated a Portuguese version and, in doing so, we aimed to symbolically unite the two countries, that share so much of their identity and culture. Dinorah de Carvalho was another wonderful discovery. Her song, Pau-piá, was a work that transformed itself throughout the process of study and interpretation, brining something new up to the last days of recording, leaving in me the desire to explore more her musical universe. Catarina Domenici, who also lives in Porto Alegre, a high class pianist and talented composer was another great discovery! During the choice of the composers, Gabriella contacted her and invited to be part of the project. And how lucky I am to be able to record two sensational songs by this powerful composer! "Healing" was love at first sight. The lullaby song literally went “through me”. "Marielle presente!" brought a totally diferente feeling: written shortly after the cruel murder of councilwoman Marielle Franco, it came to be part of the works included in this CD in the last minutes. During the final choice of songs we received a message from Catarina, who literally let all her art pour into the writing of this "protest song", which unites with one voice all women who suffered from social differences, discrimination and the abuse, in a cry for justice for Marielle! At the moment of the recording of this song, to represent the symbology of the voices of so many women as asked by Catarina in her composition, I counted on the voices of the two women who were fundamental for the realization of this CD that are Gabriella Di Laccio, a great friend, sister and Angiolina Sensale, with whom I have been working since I arrived in Italy and with whom I have developed another important friendship. This was another special and once symbolic moment, simbolizing the friendship and the richness of feelings that this incredible work has given me. Women, present! Collaborating as an interpreter to the DONNE collection, dedicated to women composers was a significant experience of my own personal artistic growth. The project was divided into three phases: that of research, musicology and repertoire, and that of interpretive study and engraving, in a magical place like Potton Hall. We entered the world of Italian and Brazilian women composers, some few with the right recognition of the musical environment of their time and of today, others unfairly destined to oblivion. Studying their compositions, with the instinctive curiosity to grasp analogies or differences, trying to mix responsibility and interpretive flair, allowed us to live the experience with enthusiasm and affinity of purpose. The piano accompaniment, always well thought in the writing of the composers, created a vocal and instrumental plot that changed color and sophistication throughout, guided us in the search for a colourful and dynamic palette that could be as diverse as possible. The solo piece by Giulia Recli: "Nicoletta's dream" is a work inspired by the Liberty style of the Italian Art Noveau period: the composer is constantly looking for atmospheric sounds, which reproduce dreamlike sensations. A dynamic and enthusiastic writing in constant evolution, almost hypnotic for the listener who lets himself be to encaputred by the music. The atmosphere created by the piece by Francisca Gonzaga is very different, which draws a melody with popular flavor on the incessant rhythm of a Brazilian dance. The piece is like a popular music from overseas, with a curious assonance with the final theme of the Hungarian Rhapsody of Liszt No. 2, of which there is a small quote, in the spirit of improvisation so dear to the Brazilian composer.